Enjoy the best inspirational, motivational, positive, funny and famous quotes by Anna Seghers. Use words and picture quotations to push forward and inspire you keep going in life! What can I expect here? You know the fairy tale about the man who died, don’t you? 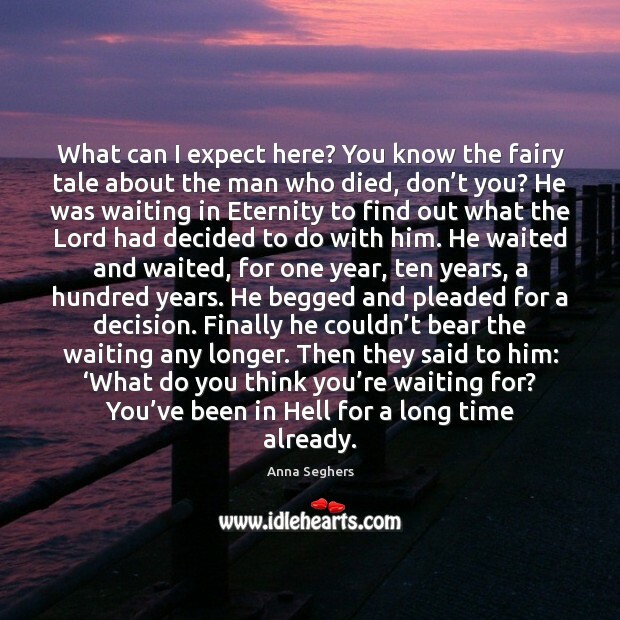 He was waiting in Eternity to find out what the Lord had decided to do with him. He waited and waited, for one year, ten years, a hundred years. He begged and pleaded for a decision. Finally he couldn’t bear the waiting any longer. Then they said to him: ‘What do you think you’re waiting for? You’ve been in Hell for a long time already.